With all the glamorous sets of wheels on display, it'd take something really different and stylish for a mainstream automaker like Kia to capture more than a passing glance at the Geneva Motor Show. But this could just do the trick. It's called the Imagine by Kia concept, and it aims to provide a glimpse into the Korean automaker's future. It takes the form of an all-electric four-door/liftgate passenger car, sized to fit into the C-segment (or "compact” in American parlance). And as far as mass-market EVs go, it looks pretty darn slick to our eyes. To that end, Guillaume and company started with a clean sheet. 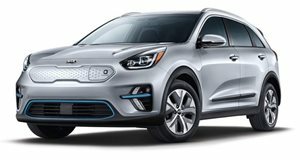 Where the electric versions of the Niro and Soul are based on platforms designed around conventional, internal-combustion engines, the Imagine concept is designed from the ground up as an EV, with a induction-charged battery pack mounted low in the chassis to optimize interior packaging and weight distribution. "We imagined designing an all-electric car that not only answered consumer concerns around range, performance, recharging networks and driving dynamism, but one that also gave you goose bumps when you looked at it, and made the hairs on the back of your neck stand up when you drove it,” added Guillaume. With no radiator to feed, he and his team reinterpreted Kia's signature tiger-nose grille as an illuminated "mask” extending around the horizontal LED headlamp slits behind a single sheet of clear acrylic. "Impulse ripples” on the lower front bumper and along the flanks to convey a sense of motion even when the vehicle's standing still. A single sheet of glass extends from the windscreen into the roof, tapering into the double-bubble, with high shoulder-lines and narrow greenhouse lending a muscular appearance. The turn signals are integrated into the bodywork, which is painted in a six layers of chrome and bronze that must be even more striking in person. The vehicle rides on an oversized, stylized set of 22-inch alloys to further emphasize its sporting appearance. And the interior is designed to be as forward-looking as the exterior design, with 21 individual super-thin, ultra-high-resolution displays positioned around the four individual seats, upholstered in leather and silk. The floating center console further augments the airy feeling inside, with Rolls-Royce/Lincoln-style counter-opening doors to gain unimpeded access, and cargo bays in the nose and under the glass rear hatch to swallow whatever the conceptual occupants of the future might want to bring along for the journey. Just how long a journey that might be, and at what pace it might be covered, we don't know. Kia hasn't released much in the way of specifications. But that just tells you how much emphasis the automaker has placed on the Inspire concept's design over its technical details.